The true Baikal winter running experience to support this Gem of Siberia and Well of the Planet Earth – LakeBaikal! The surface of the frozen lake Baikal is covered in fields of “hummocks”, small hills of ice rubble. Beneath the ice surface, geothermic springs and seismic activity cause localized melting that sometimes may weaken the ice to form holes (though the average ice on Lake Baikal in this part is over 1 meter and a half which allows trucks and vehicles up to 10 ton in weight to drive on the ice). The race “Ice Captain” and his team of volunteers and the Baikal Ice Marathon support team have the task of plotting a safe course. To get well prepared for the laying of the ice course about a month and half before the Baikal Marathon the organizers of the Baikal Ice Marathon study satellite photos of the ice surface of Baikal to see how the lake freezes the current winter in order to locate possible stable ice cracks that sometimes can be up to 8 km long. A week before the Marathon we go on and lay preliminary Marathon course. The final course (42 km 195 m or 26 miles) is laid immediately preceding the race, otherwise movements in the ice can render the support team’s effort redundant. The course for the race of Baikal Marathon is also checked by the Emergency and Rescue Committee staff before being approved as safe to drive the vans and run on the ice. opposite shore of Lake Baikal. Prior to the start of the race, competitors some years are required to partake in the precautionary ritual of “white m sprinkling”, in order to pacify the spirits of the Great Baikal. ice-rink. Wind can add to the already bitingly cold temperature and provide serious resitance to progress across Lake Baikal. Though, often the weather is sunny and with no chill factor one can even get some sun tan. The utterly featureless landscape gives little or no sense of perspective to competitors. The finish line at the port of Listvyanka can be seen almost from the start line. It is a long, cold, lonely (if not to count the mobile 5 to 6 feed and drink stands) 42,2 km trail across the baren white landscape, where progress is marked only by checkpoints positioned at 5 km intervals (with hot drinks and food). "For preservation of clean water"
“For our world, consumed by egoistic aspiration, it is necessary to review and overcome all divides and antagonistic barriers on our way… To achieve optimistic scenario, of primary importance is the education of younger generation from “child’s pot”. Children should grow with understanding of the holiness of water, value of each water droplet that carries an element of life, contains the mind and memory of entire world...” - Professor Victor Dukhovny, World Water Council Board Member. XV edition of Baikal Ice Marathon foot race (hereinafter referred to as “BIM”) is organized by "Absolute Siberia” Ltd. under coordination with Irkutsk Regional Emergency & Rescue services , within framework of Winteriada Baikal Winter Games Festival Race Director: Mr. Alexei Nikiforov. The BIM, the marathon run between two opposite shores of Lake Baikal, will take place on March, 02, 2019 on Lake Baikal. Depending on ice conditions and those of the run course, the starting line of the Baikal Ice Marathon will be located either on the western shore of Lake Baikal, near Listvyanka, or near the station of Tankhoy, on the eastern shore of Baikal. Final location of the starting point and time of BIM start shall be indicated a day before the commencement of BIM. 5.1.1. former experience of running full marathon distance within 4 hours 05 minutes time limit and half marathon distance – within 2 hours 10 minutes limit ( such running results must date back not earlier than 3 years preceding the BIM). 5.1.2. applicants whose previous long distance running results are more than indicated above, or runners who took part in no less than 10 km distance running, can take part in the XIV BIM footrace only if purchasing 6-days BIM acclimatization & training course preceding the XV BIM ( see here). 6.2.1. In order to be registered as the BIM runner one has to apply for participation filling in pre-registration form, indicating one’s long distance running experience and providing direct web-links to the footraces with protocols that can clearly show both name of a runner and his/her running result ( official protocols that can testify such a former running experience). The last foot race a runner took part prior the BIM should not be earlier than 3 years before the XIV BIM commencement. The application form has to be fully completed; incomplete or inexact filling in the form can result in failure to be finally admitted to and run in the BIM. The BIM Organizing Committee will not accept or consider any applications not containing/indicating direct, easy to find web-links to the footraces protocols that can clearly show both name of the runner and his/her running result. The applications containing only the name of the event or only its general web site will not be accepted or replied. If an applicant provides false information as regards previous running experience in the application form, and once such information becomes clear to the Organizing Committee, such an applicant will not be admitted to the BIM. Filled in on-line application has to be sent to the two e-mail of BIM Organizer: events@absolute-siberia.com , run@baikal-marathon.ru . 6.2.2. The applicant for the BIM allows the Organizer to process his/her personal data for the purposes of assessment of the applicants’ running performance and registry in the BIM. 6.2.3. After considering the application form sent by a runner, the Organizer (“Absolute Siberia Ltd.) will reply the runner with notification that he/she either succeeded in pre-registration or failed to go through the pre-registration. In case of refusal to pre-register the applicant as a potential runner in the BIM, the Organizing Committee reserves the right not to accept any complaints from such an applicant and stop any further correspondence with this applicant. 6.2.4. If a runner’s BIM application was accepted and this runner was pre-registered for the BIM race, the runner will be notified thereof, and informed when he/she will receive the invoice for the issue of payment for the BIM runner package of the runner’s choice. Upon receipt of the BIM invoice, payment as per the invoice shall be made by the pre-registered runner within 10 days after receipt of the invoice. In case, the above payment is not made by the runner during the indicated time period, the Organizer will without any prior notification cancel pre-registration of such a runner and pass the previously reserved space of this runner to another applicant who had applied later than the registration deadline, but may qualify for the BIM (same terms and payment conditions will apply). The Organizer may also notify the runner who successfully passed through pre-registration that he/she can be invoiced by an authorized agent of the BIM for the participation in the BIM. The runners should not issue any payment to any of possible agents before the receipt of the confirmation from the Organizer that the BIM Organizer authorizes such an agent. 6.2.5. The issue of payment as per clause 6.2.4. for the BIM runner package by the pre-registered runner is regarded both as this runner’s registration at the BIM foot race and the runner’s full agreement with the present statutes and terms of the BIM. 6.3. The number of the runners in the XIV edition of BIM is limited. Depending upon availability of running space of the BIM, and once the limit of running space is reached the Organizer reserves the right to stop registration any time before the above indicated deadline. 7. BIM foot race rules. 7.1. Control/cut off time for the full marathon distance is six hours, half marathon distance – four hours. 7.2. The full marathon and half marathon runners who fail to cross the 21 km mark point of the BIM course in 4 hours after the start are disqualified, and have to get off the BIM ice course , get on hovercraft, snow mobile or any other BIM support vehicle admitted to serve the BIM course for further transportation to the corresponding shore. 7.3. At any times when a judge or physician of the Baikal Ice Marathon or BIM emergency and rescue or , support team members state a runner is evidently unable to continue foot race or meet the BIM course deadline/cut off time terms, such a runner must on request immediately stop running, remove the start number and move to the available vehicle for a further transfer to the finish line. 7.4. Once the BIM starting line is on the western shore (in Listvyanka), runners in the BIM, after completing their distance, and reaching the finish line at the eastern shore, should upon first request of the judge/ any of the BIM organizing committee, and within 10 minutes after such a notice take seat in the indicated vehicle for a transfer back to the start line/ opposite shore of Baikal. Those who do not follow such a request will immediately be disqualified, and then take their transfer to the start line/opposite shore of Baikal in the last turn (after the last BIM runner finishes the BIM). 7.5. Individual start number/ bib of a runner in the BIM should be placed and well fixed on the runner’s chest. If a runner, at the start or during the BIM, fails to have the start number or it is not properly fixed on the chest disabling the marathon judges or anyone from the support team to clearly see the start number on the runner’s chest, the judge will have the right not to register the result of such a runner that will eventually lead to the runner’s disqualification. 7.6. It is prohibited t the BIM start and finish line or during the run in BIM to carry and use any neo-fascistic, nationalistic symbols; flags and banners or mantles of black color with any content in any language are also prohibited. 7.7. During BIM run presence of any unauthorized by the Organizer vehicles at the BIM ice course is prohibited. If any supporters of a BIM runner are spotted at the BIM riding such unauthorized vehicles, the Organizer reserves the right to disqualify that runner or runners once it becomes evident these unauthorized vehicles support that runner. 7.8. All media members, journalists or cameramen alike willing to give coverage, provide footage of the BIM have to be accredited by the Organizer. All media members must apply separately for accreditation details and to receive their individual credentials from Organizer , at least, two months prior the BIM commencement. 7.9. Runners showing visible signs of alcohol intoxication, drug or dope use, whose behavior is beyond the bounds of decency/common sense law (euphoria, poor coordination, memory loss, slurred speech, confusion, impaired balance, loss of muscle coordination, evident rudeness/aggressiveness), who refuse or fail to follow orders/requests of the Organizers before, at the start or after the start shall immediately be disqualified. No any complaints shall be accepted or refunds made, in such cases. 7.10. Anyone ejected from the BIM or disqualified due to the reasons indicated in clauses 7.3., 7.4, 7.6, 7.7 will be automatically excluded or suspended from any of the next editions of BIM (depending upon the severity of the connected action , its circumstances). 7.11. A runner who withdraw himself from or falls out of the BIM footrace because of any reason must take off his/her bib, and at earliest convenience then report to the judge at the finish line. 7.12. In order to provide outmost safety of all runners, avoid possible results drawing mistakes, a BIM runner admitted to the BIM footrace is not allowed to change the BIM distance he/she previously applied for and was registered. 7.13. Final admittance to the ice course of the BIM shall take place on the starting day of the BIM and in accordance with the BIM Pre-start standing order (see Cl. 14). 7.14. Rules of personal and general safety. 7.14.1 The Organizer strongly recommends that all runners during the BIM take seriously into account one-of-a-kind microclimate of Lake Baikal area, its altitude, weather-climatic volatility, difference in time zones and insufficient period of acclimatization, various effects that the energy grid of the world’s most ancient Lake may have on an individual human. Be careful, be attentive to yourself, sensate the Great Baikal while enjoying your run in a relaxed, moderate manner. .7.14.3. During the BIM in case of personal sudden physical or moral ailments as feeling sick or sudden discomfort, distress or headache, forearm aches or heart pain, appearance of sudden depression or inexplicable fear, a BIM runner must stop running, and notify the BIM support team thereof. If for any reason, there is no possibility to reach the BIM support by phone, the runner then should use the nearest red flag on the run course for filing a visual signal of an emergency, lifting the flag up and waving it then from side to side. 7.14.4. In case if a BIM runner notices another runner with a raised red flag, he/she should immediately notify the BIM support thereof, stating approximate ice course kilometer mark as the emergency spot, and then, provide first possible aid to the runner in emergency situation before actual qualified medical assistance arrives and is rendered. 8.1. The funds made available by the Organizer to hold the BIM cover organizational costs of the BIM such as pre-start work arrangements and expenses, salaries, application processing & operational costs, expenditures for laying, monitoring, keeping and marking the BIM course on the ice and its checking, transportation of participants to the BIM starting line, support and safety team costs, judges work , use of hovercrafts, or any other vehicles used for safe transfer and BIM arrangements on during the BIM on the ice, feed stations operation, start numbers and award fund - cups, medals, certificates, first aid medical service and casualty insurance; accommodation and meals as a part of BIM basic runner packages. 8.2. The cost of participation at the BIM for the Russian runners (citizens of Russian Federation) can be lower than the cost applied to the foreign runners thanks to the extra funds the Organizer raises from sponsorship sources and/or its own funds available to support the Russian runners, minimize their registration, and start fee. 8.3. The cost of participation / running in the XV edition of BIM is fixed in the amount of the BIM basic runner package cost , and is EURO 665 per any BIM runner. This cost includes one BIM registration and start fee, 2 nights’ hotel accommodation on twin room sharing basis with 2 breakfasts, one set up dinner on March 01, 2018, and one Award Ceremony Gala Dinner on Marc 02, 2018; group transfers from Irkutsk airport to hotel on Lake Baikal on March 01, 2018, group transfers on departure from hotel on Lake Baikal to Irkutsk airport on March 03,2018, transfer to the BIM starting line on the day of its commencement, BIM commemorative souvenirs and finisher award medal . Single room supplement -EURO 98 per person. One runner accompanying person packagecost - 330 euro ( incl. two nights hotel accommodation sharing room with accompanied runner, group transfers on arrival/departure as above, one set-up dinner on March 01,2018, and one Award Ceremony Gala Dinner on March 02,2018, a XV BIM commemorative souvenir. NOTE: A BIM registerd runner who travels with accompanying person and purchased BIM runner accompanying package will stay both nights at same hotel in Listvyanka. Runners coming without accompanying person first night as per BIM runner package will stay in Baikalsk ( eastern shore of Lake Baikal, near the start line of the XV edition of BIM) and second night ( after completion of BIM) witll stay in Listvyanka. 8.4.1. Euro 835 per runner for the BIM 4 days/3 nights package. The above cost includes: one BIM registration and start fee; group transfers on arrival and departure as per the package and BIM schedule, transfer to the BIM starting line on the day of its commencement, BIM commemorative souvenir and finisher award medal, 1 night hotel accommodation in Irkutsk at Marriott Hotel, two nights hotel accommodation on Lake Baikal; two set up lunches and BIM Award Ceremony Gala Dinner; services of local guide and group tour as indicated in the package. Single room supplement: euro 150 p/p. BIM runner accompanying person package cost - euro 485 p/p ( the cost including 3 nights hotel accommodation with breakfasts, sharing room with accompanied runner, group transfers as above, two set up lunches and one BIM Award Ceremony Dinner, group services of local guide, tours as in dicated in the package, a BIM commemorative souvenir. 8.4.2. Euro 895 per runner for the BIM 5 days/4 nights package. The above cost includes: one BIM registration and start fee, transfers on arrival in/departure from Irkutsk, and transfer to the start of the BIM and hotel near the start, 2 nights accommodation in Irkutsk at Marriott Hotel, 2 nights accommodation at hotel on Lake Baikal; two set up lunches and two set up dinners and one BIM Award Gala Dinner; Siberian husky sled dog ride, services of local guide and group tours as indicated in the package, BIM commemorative souvenir and finisher awards medals. Single room supplement: euro 215 p/p. 8.4.3. EURO 1485 per each runner accepted for the BIM training course (special 6-nights/7 days “BIM Training to Run on Ice ” package. The cost of this special BIM package is same for foreign and Russian nationals, on all-inclusive and twin room sharing with another runner ( accompanying person/non-runner sharing room with runner- euro 950 ). Single room supplement - euro 370 (see detailed program here). 8.4. In case if a registered runner due to any reason cancels his/her participation in the BIM, or fails to timely arrive to the start because of own fault or any reason not dependent on the Organizer , the amount paid by such a runner to the Organizer is not refundable. - March,01, 2019 – between 06:00 a.m. and 11:30 a.m. all runners gather at the Irkutsk airport for a transfer to the hotels located near the BIM fixed start. Upon arrival – check in at the hotels followed by pre-start briefing and start numbers distribution. 19:30 – pasta dinner. Overnight. - March, 02, 2019 – after breakfast pre-start zone gathering of runners for transfer to the BIM stating line. Start of the BIM accordingly. Before 18:30 – end of the BIM culminating with award ceremony and reception dinner. - March, 03, 2019 – group transfers of the runners back to Irkutsk. NOTE: A BIM registerd runner who travels with accompanying person and purchased BIM runner accompanying package will stay both nights with the accompanying person at same hotel in Listvyanka. Runners coming without accompanying person first night as per BIM runner package will stay in Baikalsk ( eastern shore of Lake Baikal, near the start line of the XV edition of BIM) and second night ( after completion of BIM) witll stay in Listvyanka ( opposite, western shore of Laek Baikal). - February 28, 2019- Upon arrival in Irkutsk, transfer to Courtyard by Marriott Irkutsk City Hotel located in the heart of Irkutsk. Check in. Sightseeing tour of Irkutsk with lunch in the historical 130th Quarter ( Irkutsk Sloboda). March 01, 2019- after breakfast transfer to the hotel near the start of the 15th edition of Baikal Ice Marathon with lunch en route. Upon arrival – check in at the hotel. Dinner. March 02, 2019 - After breakfast pre-start zone gathering of runners transfer to the BIM stating line. Start of the BIM accordingly. Before 18:30 – end of the BIM culminating with award ceremony and reception dinner. March 03, 2019 – transfer to the airport for your return flight. NOTE: A BIM registerd runner who travels with accompanying person and purchased BIM runner accompanying package will stay one night upon arrival in Irkutsk , and other two nights at same hotel in Listvyanka. Runners coming without accompanying person stay one night in Irkutsk, second night - in Baikalsk ( eastern shore of Lake Baikal, near the start line of the XV edition of BIM) and third night ( after completion of BIM) witll stay in Listvyanka. March 01, 2019 – after breakfast transfer to the hotel near the start of the 13th edition of Baikal Ice Marathon with lunch en route. Upon arrival – check in at the hotel. Pre-start briefing registration, distribution of start bibs followed by pasta-dinner. After breakfast pre-start zone gathering of runners transfer to the BIM stating line. Before the start of BIM runners must follow the BIM Pre-start Standing Order ( to be released a week or two days before the BIM commencement). Start of the BIM accordingly. Before 18:30 – end of the BIM culminating with award ceremony and reception dinner. After breakfast and check out from the hotel, tour unique and very interesting Baikal Museum, which besides a large exhibition of species of flora and fauna has an aquarium with live Baikal freshwater seals (the world’s only freshwater seals and the lake’s only mammals). Then after a short transfer enjoy ride with Siberian husky sled dogs amidst taiga-woods of Baikal national park premises. Tansfer back to Irkutsk. Upon arrival in Irkutsk check in at the Courtyard by Marriott Hotel. The rest of the day is for your own activities to explore this beautiful wintertime Siberian city - our local guide will be there to accompany you, help with your possible personal arrangements). NOTE: A BIM registerd runner who travels with accompanying person and purchased BIM runner accompanying package will stay first and last night in Irkutsk, and two nights ( March 2- March 03 ) at same hotel in Listvyanka. Runners coming without accompanying person first and last night in Irkutsk, second night in Baikalsk ( eastern shore of Lake Baikal, near the start line of the XV edition of BIM) and third night ( after completion of BIM) witll stay in Listvyanka. - February 25, 2019 –-–meet at the airport for transfer to Courtyard by Marriott Irkutsk City Center hotel. Sightseeing tour of Irkutsk with lunch in the historical 130th Quarter (Irkutsk Sloboda).In the evening – 13th edition of BIM lecture and briefing at the hotel’s conference room. Pre-start registration. Meet BIM organizer and your trainer for a briefing about your upcoming stay at the foothils of Sable Mountain.During the briefing you will also receive BIM special & exclusive products -BIM winter sports reversible vests , and a detailed program. - February 26, 2019 - – after breakfast transfer to the hotel near the start of the 13th edition of Baikal Ice Marathon with lunch en route. Upon arrival – checking in at the hotel followed by a briefing lecture on the training course schedule and features. After dinner – a lecture on Lake Baikal eco-system peculiarities..
- February 27 -March 01, 2019 – 3 days of training course program under expert guiding of experienced marathon runner. Preparation for the admittance to the start in the BIM and training these days will include series of short and longer runs in the taiga-woods and on the ice of Lake Baikal combined with acclimatization sessions to achieve good balance of myogenic tonus – skiing the Sable Mountain downhill at the alpine center, warming up at the one-of-a-kind Ice Steam bath.. Every evening – presentations and lectures. - March 02, 2019 – after breakfast pre-start zone gathering of runners transfer to the BIM stating line. Start of the BIM accordingly. Before 15:30 – end of the BIM culminating with award ceremony and reception dinner. 10.1. Drink and feed points en route the BIM course shall be located at 10, 15, 21,28,35,39 km mark points. The feed & drink ration includes tea, non-gas water, nuts, dried fruits, chocolates, cheese. The feed stations/point logistics and intervals though can slightly be changed depending on the BIM course conditions the night before the Baikal Ice Marathon commencing. If such a change occurs, the participants of the BIM shall be informed thereof at the pre-start registration/briefing or even at the starting line. 10.2. Near the eastern shore, the BIM course can be covered with fresh layer of snow (from 15 to 25 cm thick and up to 500 m long); in some places that are closer to the western shore there can be sections of open/naturally polished ice surface from 35 m to 400 m long; in other places there can be fields of so-called “kolobovnik” – sections of the «pancake” or “plated” ice with granular tops of blurred color , frozen in the surface, which represent significant difficulty to run or even walk smoothly and require carefulness in fast moving on them. The average air temperature range in the 1-st decade of March in the area of Baikal Ice Marathon course: from – 14 below zero to – 27 below (eastern shore) Centigrade near the starting line and at time of starting, from – 7 down to – 14 in the middle of the Baikal Ice course, from – 12 up to + 1 Centigrade closer to the western shore after 02 p.m. Chill factor of the local winds can,certainly, male you feel the temperatures as significantly lower. In February and March, on Lake Baikal, there are weather conditions with so-called ”pozemka” wind blowing, i.e. severe ground blizzard, when loose snow ( that is already on the ice) is lifted by and intensively blown across the ice by the wind. When this happens, low drifting snow covers any tracks or prepared courses, produces blizzard snow dunes that make it hard to move , impossible to drive. On the video below, the effect of Baikal ground blizzard in the area of the BIM is shown. Though visibilty is real good and one can clearly see mountains on the opposite shores of the lake, but in about half an hour, after such a ground blizzard blowing, the tracks on the ice will be hidden under deep loose snow which upper surface within next 3-4 hours is to turn into firm snow crust cover. Snow removal and ploughing by lightweight bobcat vehicles is practiced by the BIM organizers on a day preceding the BIM, but only if the ice pressure ridges conditions, ice stability and its thickness allow. However, often the efforts of the snow removal team are redundant due to the winds,blizzard and low drifting snow. On the day of the BIM, to avoid any extra pressure on the ice and provide runner’s safety, no any snow removal is carried on by any vehicles. Therefore, a BIM runner must be ready to run on polished ( as skating rink) ice surface, or on pancake, rubble or cobblestone Ice, ice surface with slush balls hidden under layer of snow, at weather with severe blizzard accompanied by ground wind, facing the strong Angara wind or piercing “khius” wind , and , sometimes, with plenty of dazzling sunshine. Weather and ice surface conditions during BIM can combine all the above features. - Lined gloves, or double pair with under poly pro, down mittens, Outer Goretex mittens (goretex and polypropylene cloths are an aid to keeping your body warm and dry. The wicking action of polypropylene is excellent. Goretex being a breathing fabric is the ideal outer layer, and may help keep you more comfortable than nylon which does not breathe and may contribute to excess perspiration). - Wear wicking, dry socks. - Running Shoes. For those experienced long distance trail runners who usually run fast, and want at the BIM to race performing best time we recommend long distance running shoes ith ICESPIKE or ICEBUG, or any other solid alloy crampons twisted in soles in order to provide for maximum cohesion, better stability and safety while running on ice ( if it's over 8 cm thick). All those runners willing run in well moderate, stable pace within cut-off time, we will recommend good trail running shoes with deep protectors and wide holdout toe. 10.4. BIM runners not following the above recommendations and who at the start line of BIM will not have any suitable protection of their face and hands will be disqualified, and not admitted to run the BIM race. No any refunds shall be then paid. Winners of the BIM (full marathon and half-marathon distances both in male and female groups will be awarded with Baikal Ice Marathon-2019 Winner Cups and medals. 2-nd and 3-rd place winners shall be awarded with Baikal Ice Prize Cups and medals. Each finisher will receive BIM medal, T-shirt and a certificate of the BIM achievement. Some other testimonial awards such as the Cup of Baikal Ice Appreciation, Baikal Ice Partner Cup and commemorative medals of Baikal Ice Marathon-2019 for the notable performance during the foot race may be introduce and be awarded to runners chosen by the Organizing Committee members or possible Sponsors. Several very special awards will be presented to a few runners to commemorate the XV edition of BIM. Each runner of the BIM within a month after the finish of BIM will receive special BIM book narrating the 15-year history of Baikal Ice marathon and its runners. All the BIM runners who finish their marathon distance within the control time shall be awarded with commemorative medals of the Baikal Ice Marathon and certificates. Baikal Ice Marathon is held on the frozen waters of southern Lake Baikal – the world’s deepest, largest in volume (22 % of the world’s surface water) and oldest – over 20 million years - freshwater lake that supports unique animal and plant life (¾ are endemic species) . Well of the Planet Earth, Sacred Sea, Siberia’s Pearl or Treasure of the World are few of the names that respectfully and with reverence refer to Lake Baikal. And in first turn, the Baikal is a live body of Great Water - the beginning and the continual of life on Earth. Throughout entire run in the Baikal Ice Marathon or stay on the shore of the sacred Baikal we urge not to throw away on to the surface any piece of rubbish and anything at all, keeping in mind both cleanness of water and landscape’s natural beauty. One can leave the rubbish, used cans, cups etc. at any of the feed stations on the Baikal Ice course, give it away to any one from the Baikal Ice Marathon support or rescue team, or carry with you until you encounter any of the latter. Disqualification can be applied as punishment for those who violate the above request. Safety of the runners during the Baikal Ice Marathon will be ensured by the Baikal Regional Rescue and Emergency Service staff , use of the hovercrafts, availability of doctors and 1st aid medical service . Each of the runners will also be provided with personal medical casualty insurance valid from start and until the finish of the Baikal Ice Marathon. 13.1. The pre-start zone of the BIM is at accommodation facilities where runners will stay on March,02,2019. 13.2. BIM start line is to be fixed one day before the BIM commencement. 13.3. Pre-start registration and briefing, distribution of BIM start numbers shall take place at the hotels the runners will stay on March,01,2019 from 17:00 to 19:00. 13.4. During the pre-start registration together with the start numbers/bibs each BIM runner will receive a plastic bag having an attached tag with a number that corresponds to the runners’ start number/bib and his/her distance in the BIM. This plastic bag with a number tag attached is to be used by a runner before the race begins on March 02, 2019, to put in the change cloths that a runner may require after finishing the distance of the BIM race on March 02,2019. The overall weight of the cloths should not exceed 3 kilos. We urge you to refrain from putting any other items, belongings, valuables other than change cloths. The BIM Organizer shall not bear any responsibility for any loss of your other belongings put into the change cloth plastic bag by the runner in violation of the present clause term. 13.5. Runners should be at the pre-start zone (hotel lobbies) at 08:20 a.m. on March 02, 2019. 13.6. Before boarding the transport vehicles for a transfer to the starting line runners should put their start numbers on, have them well fixed and clearly visible on their chest; and be prepared for getting on their vehicles assigned to them for a transfer to the starting line. .
13.7. Boarding the transport vehicles to the starting line is to begin at 08:30 a.m.( if not advised other during the briefing on March 02,2019)/ Each runner is to board the vehicle he/she will be assigned to in accordance with the boarding name list. When required by the the Organizers, the BIM runners will be notified of the details of their transport assignment list during the briefing on March 01 ,2019. The BIM runners will have then to strictly follow the details of this transport boarding list. Accurate and correct vehicle boarding by the runners at the pre-start zone is regarded to be an integral part of the final admittance to the start of the BIM. 13.8. Runners who fail to arrive to the per-start zone and board the above mentioned assigned vehicles in time shall be removed from the BIM race and disqualified, and no complains or refunds shall be accepted or done by the Organizer. 13.10. After arrival to the start line all runners will be invited to get off the transfer vehicles, and walk to the start line. Near the start line, runners shall be kindly then requested to show their reverence for Baikal: using a ring finger sprinkle the milk from the cups in to 4 sides of the Earth and drink the remaining content; or alternatively after the sprinkling just put the milk to the lips and then gently emptying the rest out on to the ice. A couple of minutes after this reverence for Baikal ancient ritual the sound from the handy loud speaker will mark the start of the XV edition of Baikal Ice Marathon “For preservation of clean water”. 13.11. The Pre-start Standing Order of BIM can be changed by the Organizer. The BIM runners in this case will be timely informed thereof. 13.12. Runners must follow the BIM official announcer/ referees’ instructions at the pre-start zone and at the start line. Runners whose conduct at the pre-start zone or at the start line disturbs the time schedule and general order will be removed from the start and disqualified. The official languages of the Baikal Ice Marathon are Russian and English languages. 15.1. Aimed at providing maximum safety and comfort of the runners during the BIM, the Organizer reserves the right to change time and place, order of the activities/ measures in the BIM. 15.2. The present BIM Statutes and Rules in no way can be regarded as an obligation of the Organizer to approve or confirm any person for participation in the BIM. - "As an Australian, the attraction was intense to run the Baikal Ice Marathon because in our country there is nothing to compare to the vast white wilderness and frozen beauty of Lake Baikal in Siberia. On the sunny and frosty morning of the 2012 event it was a privilege to stand with competitors from all over the world to bless this ancient and sacred lake. It is tradition to pacify the lake god Burkhan and hope for a safe passage across the lake. This year the offering was with milk sprinkled north, south, east and west. It was an honour, not only to bless the lake but to experience the 42.2km journey on foot across its frozen water. The pristine snow, pure air, stunning landscape and comfort of knowing that friendly faces welcomed us at each of the drink stations served to enhance this amazing experience. Not far from the finish line a large bird flew directly towards me and when it was overhead it greeted me with a kind and welcome call, as if to say "you are nearly there" - I will never forget it. Burkhan was kind to us that day as the predicted winds did not arrive and we were treated to a perfect sunny day. A huge thank you to everyone involved in the organisation of this magnificent and unique event. It was an absolute joy and I look forward to returning to Lake Baikal soon." - Maybritt Elisabet Prahl, of Sydney, Australia (female winner of the 8-th Baikal Ice Marathon wo achieved new world record of running marathon on ice). - "After my first run on the Lake Baikal, I decided to come back again and I already ran three times. This year was my first try to run a full marathon which I wished to do for a long time. I trained myself a lot and participated in several marathons in 2011. Every run were for the Baikal. Finally, my dream comes true. I ran from a shore to the opposite shore with enjoying the time talking with the great nature of Baikal. The cleanest water, the most beautiful ice, the freshest water and the kindest people are the treasure of Russia. I wish I can come back to this hallowed lake every year. Thank you, Baikal!! “ - Higuchi Yasuaki, Japan. - "The run, I won’t deny, was something of a slog: even the toasts we drank in milk at the start to appease the lake spirits could not moderate the toughness of a featureless ice field where the brain can find no progress markers and distances are impossible to gauge. Yet the sense of achievement on reaching the little wooden hut set up in mid-lake after 21km (13 miles) and two hours 25 minutes was extraordinary, and as we drove back by hovercraft the otherworldly beauty of Baikal worked its magic." - Lucy Ward, UK. - "On 3rd March 2012 Trevor and I finished the Baikal Ice Marathon in Siberia. We crossed the finish line in 5 hours and 3 minutes, running on one of the most unique landscapes on the planet. Conditions on the day of the race were exceptional - Heaven gave us blue sky and lots of sun. In such conditions, a new world record was set of marathon running on the ice! Our race did not beat any records, but we succeeded in finishing the race on the beautiful frozen scenic trail and it was for us a huge achievement" - Dr Philip Blezdel, UK. - "There are a few adventures that I have undertaken, that really stayed on my mind for a long time. Of course I remember them all, but they tend to merge and blend and I lose some of the details. Sometimes it’s just the beautiful scenery you find yourself in. Sometimes it’s the outstanding physical or aesthetically pleasurable experience. Sometimes the good company or the inspiring people I met, or the different and admirable culture, or the unusual circumstances. And sometimes it’s all of the above. And that’s how it was: the Baikal Ice Marathon." - Lora Nicolai , Bulgaria. - "It was a great privilege to run across this vast and beautiful expanse of ice. I took part with my Embassy colleagues to raise awareness of global climate change and the contribution which each of us can individually make to save energy from fossil fuels. LakeBaikal supplies a sixth of the world’s fresh water so it is crucial that we make global efforts to preserve important natural resources such as this for future generations” - Julia Knights, UK. 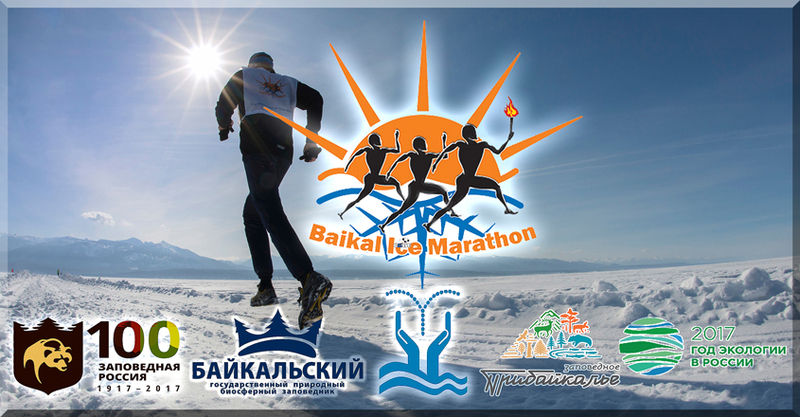 - "Baikal Ice Marathon is Russia's most exotic foot race! " - Gennadyi Vasyukevich, Russia. - "It is with great sincerity that I share my compliments with you regarding a wonderful experience in your country in association with running the VIII Lake Baikal International Ice Marathon. The event was masterfully organized to the extent I will say that the organization could only be topped by the sheer beauty and majesty of the setting. Without a doubt, Lake Baikal is a true wonder of the world, and I feel very fortunate to have traversed its ice-covered surface. I can only imagine how beautiful the Lake is when it is not frozen. The race was fair- yet extremely challenging. It is a race I take immense pride in completing as I move toward running a marathon on every continent. I can imagine no experience more unique on the Asian continent. Staff members were extremely professional. The Russian people were wonderfully hospitable during my entire stay, and I will always treasure the memories of my visit to Listvyanka, Siberia. Thank you for organizing a great event! “ - David Bryan, Portsmouth, NH-USA. - "There’re only few places in the world where you can run a marathon on ice. On Lake Baikal it was harder than on Yukon in Canada." – Udo Mueller. - "This excellent organized event was AN ICE COLD ORGAZM!!! Please, continue on with your efforts." – Stefan Schlett. - "The experience of a life time. Thanks you and I hope there will be a chance to come back." – Claus Neumann. - "The Ice Marathon on Lake Baikal is one of the best in the world besides Antarctic, Mount Everest or Mongolia Marathon." – Peter Clark. - "For people who are coming from European countries the atmosphere of this race was “one-of-a-kind”. Step by step was enjoyable and sometimes difficult, because - some little snow fields were breaking the rhythm of run." – Henry Kaluza. - "Ten thousand kilometers away from one’s home feeling to be familiar with friends…42.2 km is much too long for this lake but you managed to make a unique event…” – Maria Kurz. - "The Baikal Marathon is extraordinary: environment, temperature, and staff… My congratulations for the perfect organization." – Michael Siebert. - "Very nice run and superb organization: everybody was nice and helpful to us. "– Claus Lehr. - "Thank you. This was a great Race across wonderful Baikal: perfect organization and friendly staff. Also nice that it was possible for my girlfriend as “no runner” to follow the race very close. Good luck for more adventure races on Baikal." – the 'Swiss' Roland Haechler.